My big sister turned 30 last weekend – HAPPY BIRTHDAY BECKY!! I wanted her to a have a really special day and of course, that included making her a birthday cake she would never forget. 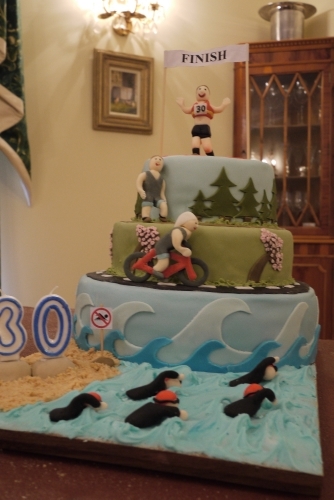 Like me, she loves baking and decorating cakes so she probably would have liked to make her own, but when I saw a picture of this cake here a while ago I knew straight away that I had to make it for her – she’s a triathlete so what could be more appropriate than a 3 tier triathlon cake?! If she feels that she’s missed out on the baking and decorating, I guess I’ll let her make mine in a couple of years! As usual I gave myself way too much to do last week – not only did I have to make her cake but I decided to make her present too. She couldn’t tell me anything that she wanted and just said it was the thought that counts so I came up with 30 memories from when we were growing up and filled 30 mini jam jars with things related to these memories and wrote little notes to go with them… it took me way longer than I expected so by the time it came to Wednesday evening I hadn’t even started making the cake. Luckily Mum had made 2 of the layers – the top and the bottom – and covered them in pale blue icing so all I had to do was make the middle tier and all the decorations. So on Wednesday night I made a start by making the middle tier – a chocolate biscuit cake (recipe to follow soon once we’ve tasted it!). I thought I would have time to make the people during the week but completely ran out of time so I took Friday off work and spent pretty much the whole day assembling and decorating the cake, and making the people to go on it. 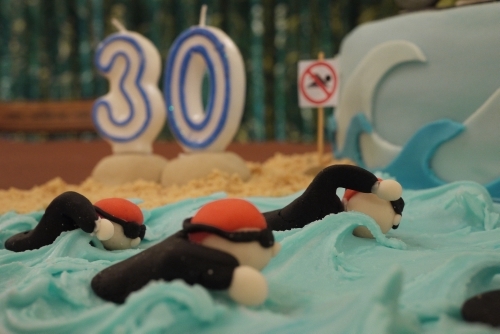 These little swimmers were my favourite part of the cake. The other people were ok, but I made the mistake of making them before I started assembling the cake and they turned out to be too big, so I had to start over again… which meant I made them all twice! By the end I just wanted to give up but I knew that wasn’t an option – if one of the people was missing then it just wouldn’t be right. So I persevered and eventually got there. 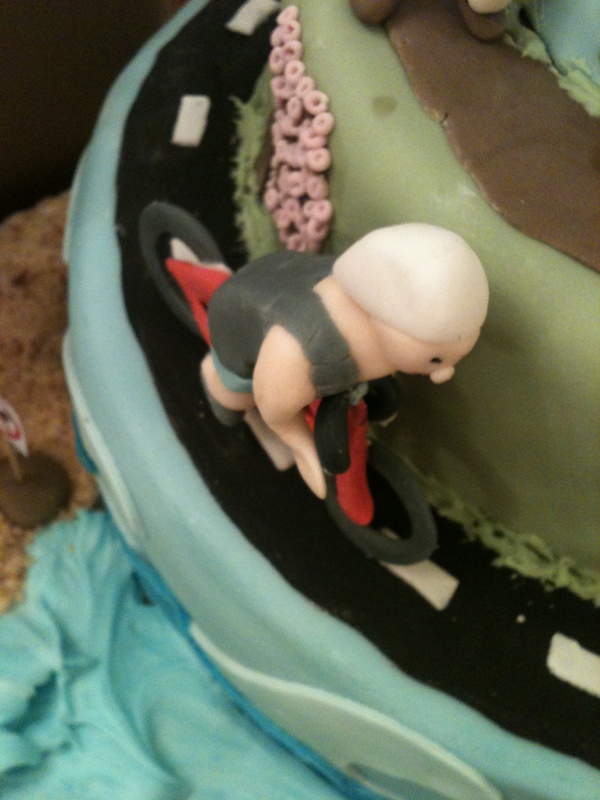 The bike was one of the trickiest pieces to make – I attempted it several times and in the end made it out of flower paste, with some wire inside to support it. 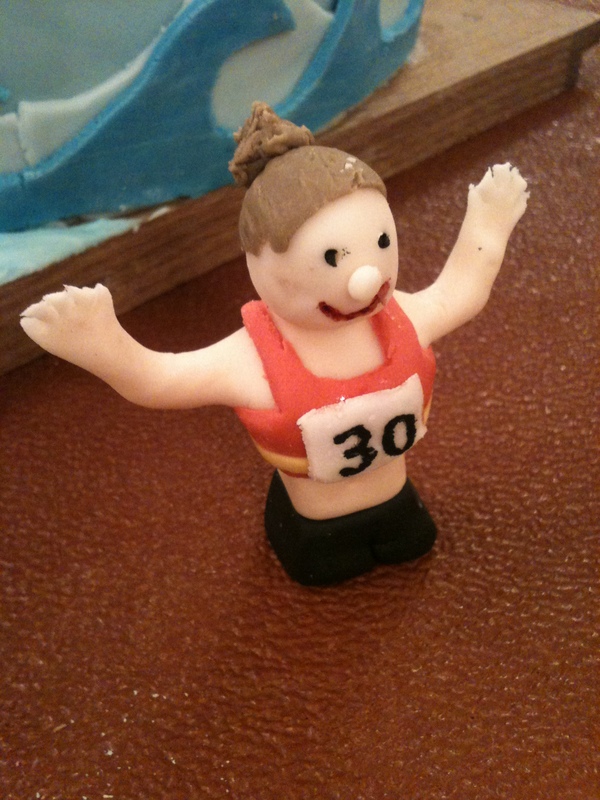 The standing people were also tricky – I ended up strengthening the legs with wire and cocktail sticks. 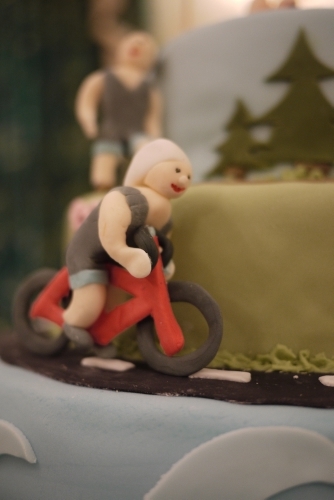 I ended up making the finisher in 2 parts – I stuck the legs to the cake and let them harden overnight and then stuck the body on top in the morning. I clearly didn’t stick it on well enough because it fell off at one point! I tried to make it as personal as possible so I made the cyclist and the first runner wearing Tri Project kit, which she wears when she races, and I made the finisher wearing the colours (red and yellow) of her running club, Serpentine. 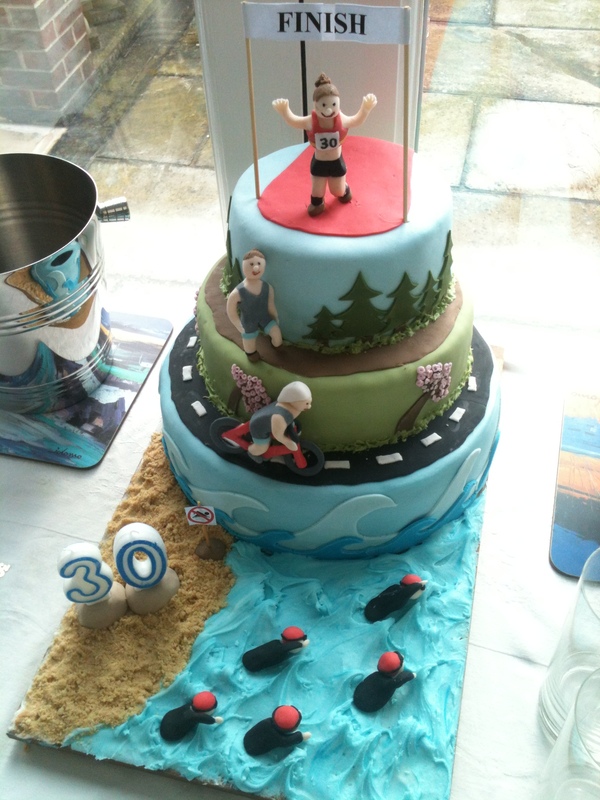 What a brilliant cake! Good skills!